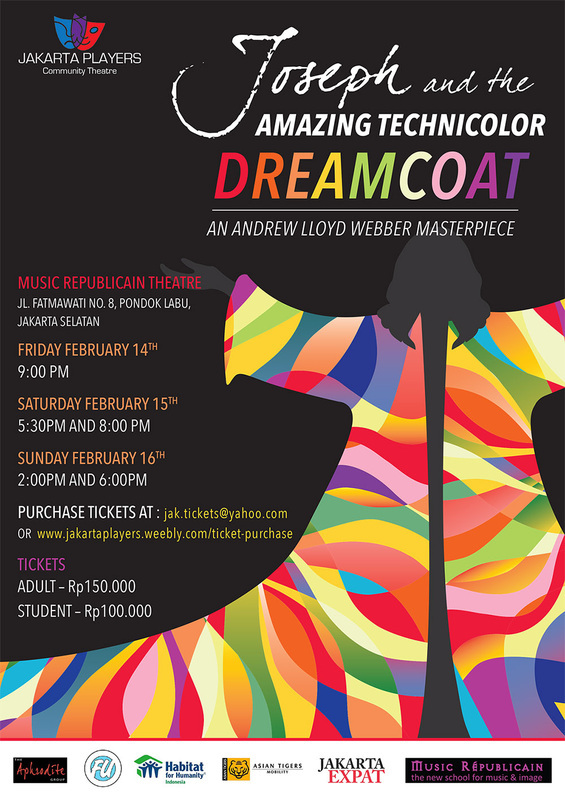 Tickets are on sale for the Jakarta Players' newest production, "Joseph and the Amazing Technicolor Dreamcoat"
It's a New Year and what better way to start the year than with a bit of musical theater. In the wake of Jakarta's infamous floods the Jakarta Players are poised to bring a bit of sunshine to the city with their next performance, "Joseph and the Amazing Technicolor Dreamcoat." The Jakarta Players are excited coming off their high energy, fun-filled performance of Broadway ke Java: A Musical Revue. Many of the talented cast have returned to bring their fantastic voices to this beloved Andrew Lloyd Webber classic and we are also excited to welcome new talent to our group, including our gifted children's choir. Joseph and the Amazing Technicolor Dreamcoat is a musical with lyrics by Tim Rice and music by Andrew Lloyd Webber. The story is based on the "coat of many colors" story of Joseph from the Bible's Book of Genesis. This was the first Lloyd Webber and Rice musical to be performed publicly. The show has little spoken dialogue; it is completely sung-through. Its family-friendly storyline, universal themes and catchy music have resulted in numerous productions of Joseph and the Amazing Technicolor Dreamcoat; by 2008 more than 20,000 schools and amateur theatre groups had successfully put on productions. The Jakarta Players will perform Joseph at their well-loved venue, Music Republicain in Pondok Labu on Jl. Fatmawati. on Valentine's weekend, giving our patrons an excellent gift for their favorite Valentine's. Joseph is a clean, fun, very family-friendly musical, and excellent option for a family outing and weekend entertainment. We will have 5 performances, giving you plenty of opportunities to catch the show, or even come see us more than once! We look forward to seeing you for another weekend of musical theater!